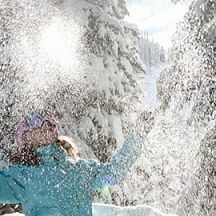 Sun Peaks ski resort in Canada is a friendly resort with a charming ski-through village and wonderful skiing. 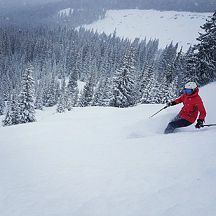 Plus, thanks to some new and exciting terrain, Sun Peaks now has plenty of reasons to attract hard-core skiers along with its mainstay families and older couples. The recently opened Gil’s zone. Hit it up on a powder day. The unique ski-through village means much of the accommodation is ski-in ski-out. Despite being Canada’s second-largest resort it’s not overcrowded. The charming Nancy Greene, former ski racer, current senator and Sun Peaks local. A good mix of lodging types from budget hotel rooms to luxurious townhomes and everything in between. Ski with Nancy Greene and/or a ski host to discover their favorite spots on the mountain. Check with guest services for schedules. First Tracks tickets are available every Monday, Wednesday and Saturday, including breakfast. The Mt Morrisey side isn’t well connected and requires a flat traverse, walk, skate or bus to get back to the main resort base. While there are a couple of bars (including a happening après spot), don’t expect a Whistler-style vibrant nightlife. Sun Peaks is officially Canada’s second-largest ski resort, after Whistler Blackcomb. With 4270acres/1728ha of skiable terrain there is enough skiing to be had here to keep most skier types happy for days on end. And when combined with a chocolate-box cute, ski-through village it truly is worth the visit. The first chairlift in the area was installed in 1963 and the resort became known as Mt Tod. 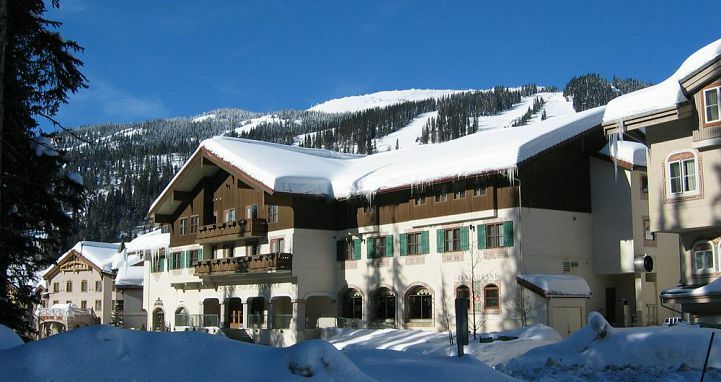 But it wasn’t until 1993 when it was bought by a Japanese company, renamed Sun Peaks, and Nancy Greene and her husband Al Raine arrived that the resort really took off. Nancy and Al had been instrumental in the early development of Whistler, so it’s not surprising to see similarities between the two - Sun Peaks village is like a much, much smaller version of Whistler Village. Fortunately for skiers, expansion is continuing throughout the mountain too. In 2002 the ski area changed significantly after the instillation of an express quad and opening of terrain on an entirely new mountain (Mt Morrisey). Since then, the resort has continued to open more terrain including, most recently, two new black runs on Mt Morrisey and, best of all for advanced skiers, the expansion into the previously backcountry area near the top of Mt Tod called Gil’s zone. This area has some beautifully gladed steeps that are the pick on a powder day. And while the addition of this new terrain will delight hard-core skiers, Sun Peaks’ key strength is its long intermediate groomers, quality of snow and quaint alpine village that makes it a truly perfect destination for families and older couples. The Sun Peaks ski area is spread across two main mountains and their associated ridges, valleys and bowls. The village forms the core center of the resort and from there it’s relatively easy and quick to access almost all the mountain. Sun Peaks has four express quads, a couple of older chairs, and a bunch of surface lifts. Sun Peaks receives on average 6m/20ft of snow each year, which is less than many of the BC resorts. Sadly, Sun Peaks generally misses big powder dumps. But what does fall is generally good quality, dry snow. The beginner area is conveniently located at the village base, on a separate slope that doesn’t get bombarded with other skiers. It features a magic carpet and platter lift that run until 7pm on holidays and weekends. The tubing carpet runs in the same place and operates until 7pm every day. Because of its location, mom and dad can happily relax at an après bar while watching their kids do lap after lap after lap of the beginner run! 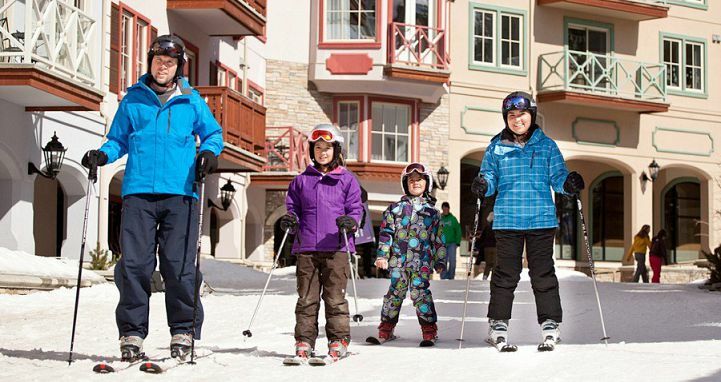 The ski school center, rentals and lockers are located in the Village Day Lodge, right at the base of the Sundance and Sunburst lifts and steps from the beginner area so everything is very easy and quick to get around. Sun Peaks really is an intermediate skiers’ paradise. More than half (52 per cent) of the resort is rated as intermediate. This terrain is made up of long, well-pitched, expertly groomed runs, some beautifully gladed trees (particularly on Mt Morrisey) and short but fun sky-high runs at the top of the West Bowl T-Bar. Most intermediates will also be able to enjoy many of the black runs, since they aren’t crazy steep and are well maintained. The new terrain expansion has mostly benefited advanced and expert skiers. Gil’s zone is a powder playground in an area that was previously beyond the resort boundary. It requires a little hike and traverse to get to but is well worth your while. There are also a couple of short steep pitches off the Burfield and Crystal chairs. 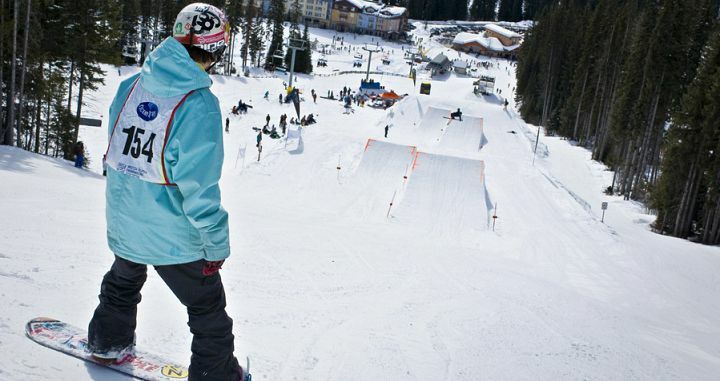 Sun Peaks has partnered with Rockstar for its terrain-park facilities, which are impressive (some big jumps!). There’s no night skiing at Sun Peaks. 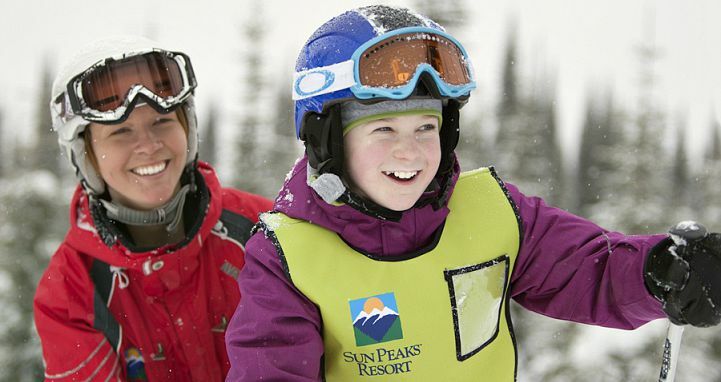 Sun Peaks is absolutely perfect for families. It is easy to get to, mostly easy to get around and the ski-school meeting point and beginner areas are conveniently located in the center of the village where many runs funnel to (allowing you to check in during the day). The village is a pedestrian (and skier!) friendly area making it safe for kids to run around and there isn’t a lot of traffic in general. There are a variety of non-skiing activities (see list below) for kids, but those with enough energy are able to keep skiing on the village platter or tubing carpet until 7pm. 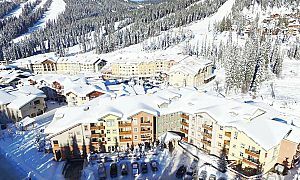 There’s a great variety of accommodation in Sun Peaks - from standard hotels to luxury residences, condos and townhomes. In general the accommodation represents good value. 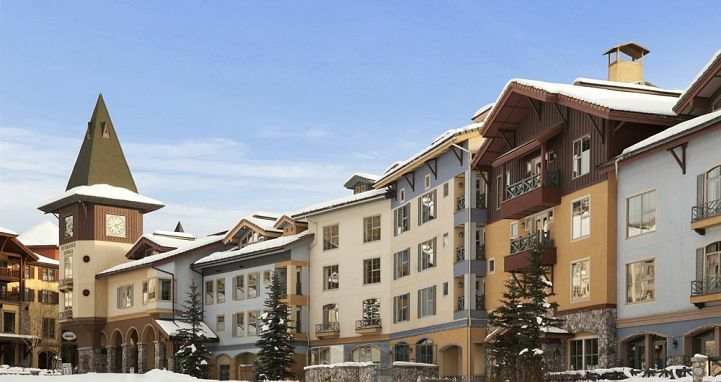 The hotels in Sun Peaks are all situated in the core village, therefore making each one ski-in ski-out. There’s a lot of townhomes and condos in Sun Peaks, though some require a long walk to the village or a car to get around (the skier shuttle bus doesn’t service a lot of the townhomes). The condos in the core ski-through village are a lot smaller than those further out. 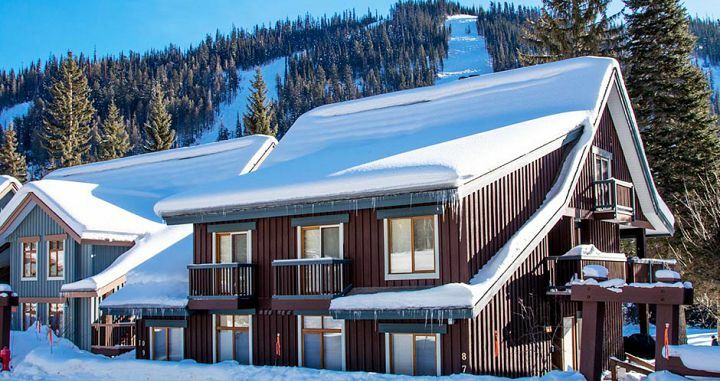 Read our detailed reviews of accommodation in Sun Peaks to choose what is right for you and book lodging or Sun Peaks Ski Packages via Scout. 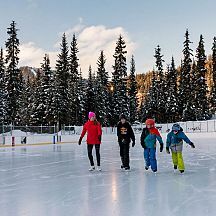 For a small, high-alpine village, there’s a surprising amount of extra activities in Sun Peaks, particularly for families. They include snow groomer rides, dog-sled tours, ice-skating, tubing, snowmobile tours and snowshoeing and bungee trampolines. There are also kids craft nights and fondue dinners with an evening descent and horse-drawn sleigh rides. Sun Peaks has 34km of groomed cross country trails that wind their way through the picturesque valley and throughout the village. Some scenic trails with beautiful views also go off the back of Morrisey Express. The resort offers shuttles to Kamloops to see ice-hockey matches and to do grocery shopping. Sun Peaks is located in interior BC, 45 minutes from Kamloops. The main airport gateways are Kamloops (domestic only) or Kelowna (flights from the US and Canada). Airport shuttles to Sun Peaks meet all flights into Kamloops. Airport shuttles to Sun Peaks from Kelowna are available on select flights. Outside of scheduled shuttles, private charters and car rentals are available. It takes just under three hours to drive from Kelowna. Alternatively, if you’re looking to make it a road trip it’s 4.25 hours from Vancouver or 8 hours from Calgary. Sun Peaks is a great resort to combine with others, particularly Big White, Silver Star or Whistler. Getting around Sun Peaks is very easy if you’re staying in the main village – since everything is within easy walking distance. 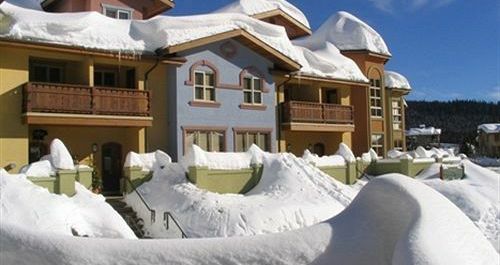 If you’re staying at a condo or townhome outside the main village, most are connected to the village via a marked snow covered pedestrian path, which takes up to 20 minutes depending on your location. There is a complimentary resort shuttle connecting some townhome areas, but not others. Sun Peaks is open from the end of November until early April. The best time of year to visit is typically between mid-January – late February. Some off-piste parts of the mountain do require a fair amount of snow coverage to open, however the groomed slopes are generally well covered.